Sugarcane production in Africa is an important activity and employ's an estimated six million people. Given these contributions, any factor affecting the industry has an impact on the overall economy. With a relatively low adaptive capacity and poor forecasting systems and mitigation strategies, sugarcane farming is anticipated to be significantly impacted and vulnerable to climate change impacts, such as droughts, floods and extreme weather events. Additionally, the cultivation of sugarcane entails its risks of negative environmental impacts, including damage to land quality and biodiversity through overuse of fertilizers and pesticides and increases the pressure on potentially scarce water resources. Climate change is not the only challenge the farmers are facing; access to electricity and irrigation, as well as social and business issues, like poor governance, management capacity and unsteady sugar prices, have to be tackled. In general, there is not only a lack of knowledge about the environmental impacts of climate change but also about sugar cane business developments. 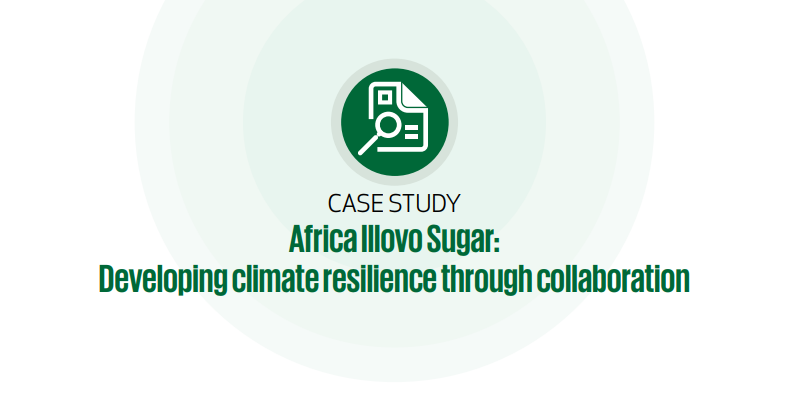 To improve the climate resilience of sugarcane growers and reduce the associated business risks, taking their climate-related risks into account, a partnership between the Climate Resilience Infrastructure Development Facility (CRIDF)1 and Illovo Sugar was developed. The Chiansi area in Zambia is characterised by poverty and underutilization of available resources.